I'm so glad you're here! It's time for another quilt tutorial in the Rockin' Rectangles serial, and today's quilt should have you thinking of spring during these gloomy, snowy, cold winter days! In fact, when I was taking these pictures, the song "My Girl" kept running through my mind... "I've got sunshine, on a cloudy day... when it's cold outside, I've got the month of May". 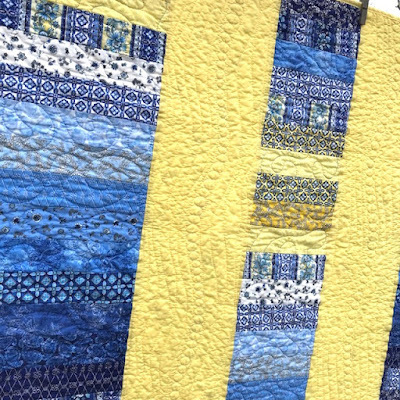 And hence the name of this quilt - Sunshine on a Cloudy Day! Quilt Size: 55" x 84"
Fabric Requirements: One jelly roll, or 42 strips of 2.5" wide fabric in various prints; approximately 1 to 1.5 yards of a solid for the contrast strips and binding. This is such a simple quilt, and rather 'loose-y goose-y' in how you make it. 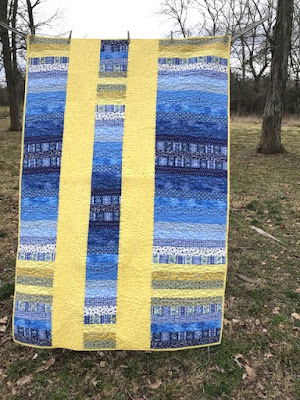 I had a jelly roll that had been in my stash for way too long, and that's what I used for this quilt. However, if you don't have a jelly roll, you can use leftover 2.5" wide strips from other rolls, or cut 2.5" wide strips from your stash. You could also make this with leftover bits of binding, as long as the pieces are about 42" long. And if you want a shorter quilt, you can use fewer strips. Thirty strips would yield a 60" long quilt! See, that math is easy. First step is to arrange your strips in the order you want to sew them, then sew them together along the long sides of the strips. 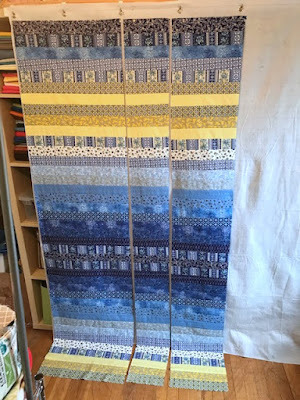 And here's a tip: looking at your quilt, if you sew one strip left to right, then the next strip right to left, alternating your stitching direction, your top will stay straighter on the ends. Another tip (which I didn't do with this top, but thought of afterwards) is to straighten up the edges every five rows or so. That way you will end up with a wider piece. I sewed all my strips together, then tried to straighten up the edges and ended up losing a good bit of my piece because it ended up slightly skewed before trimming. Now comes the math part! And don't freak - it's not hard math. You want to divide your newly squared piece into three sections. I measured my piece, and it was close to 40" wide. I chose to make my sections 20", 8", and 12" wide. Choose whatever proportions seem pleasing to you! After you've cut your "made cloth", take the center strip and flip it upside down to reverse the order of the strip layout. Isn't that pretty? Next step is to figure out how wide you want your finished quilt. I wanted mine close to 60" wide, but didn't want my accent strips too wide, so I cut my accent strips 8" wide. To decide yours, take your preferred width and subtract the width of your "made fabric" piece, and then subtract one more inch for seam allowances. Divide the result by two, and add a half inch more for seam allowances, and that's how wide you should cut your accent strips. For visual balance, your accent strips probably shouldn't be wider than your narrowest "made fabric" strip, but that is entirely up to you. Sew the accent strips between the print strips, and voila, your quilt top is finished! Then comes the fun part - the quilting! All of that solid fabric is a prime place for some fun free motion quilting or even creative straight line or ruler work quilting - if you have time. If not, it will still look good with a quick random meander. As you can see, I had a bit of fun with mine, putting in curvy lines and filling in some of the space with pebbles. It makes for interesting textures! I did a simple random meander in the print portions, only using the more time-consuming quilting in the solid areas where it would show the best. 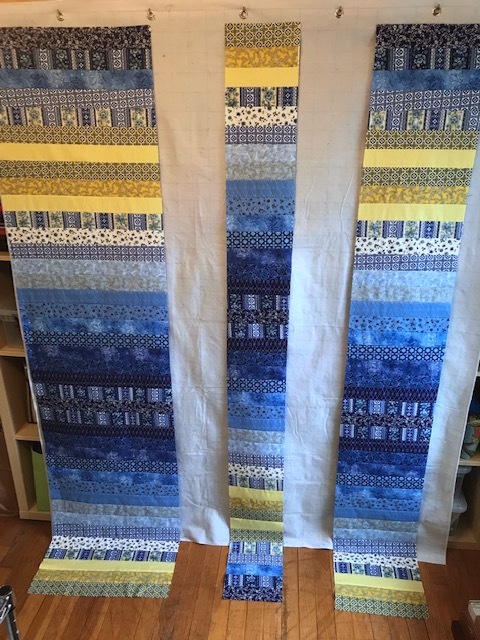 Using 42 strips, this quilt is approximately twin size, a good size for the Carolina Hurricane Quilt Project, which is requesting bed size quilts. If you wanted to make a larger quilt, you could double the "recipe", using two jelly rolls and having three, four or even five accent strips. So how's that for a little Sunshine on a Cloudy Day? Maybe we should send one to Punxsutawney Phil, who apparently didn't see his shadow and is predicting an early spring - bless his little furry heart! Spring will come, as it always does. Anticipating it is half the fun, isn't it? Remember that if you want to get a head start on one of the later tutorials, you can press your strings and cut them into 8.5" lengths. 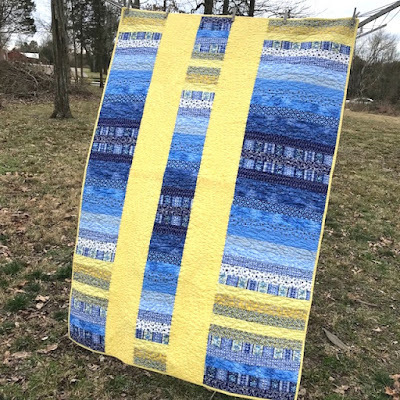 I hope you're finding these tutorials useful for (a) using up things that have been gathering dust in your stash and (b) getting you inspired for the Hands2Help Comfort Quilt Challenge, which starts in a little over a month! Be sure to come back next Sunday for another fun, super easy tutorial! Lovely shades, and the way you divided it into sections, a super pattern. What a clever idea. The quilt pattern is cute. Thanks for a good tutorial on this. Design ideas are always welcomed. Love the name! That looks like a very fast quilt to work up! Wonderful charity idea. I love your sunshiny quilt! 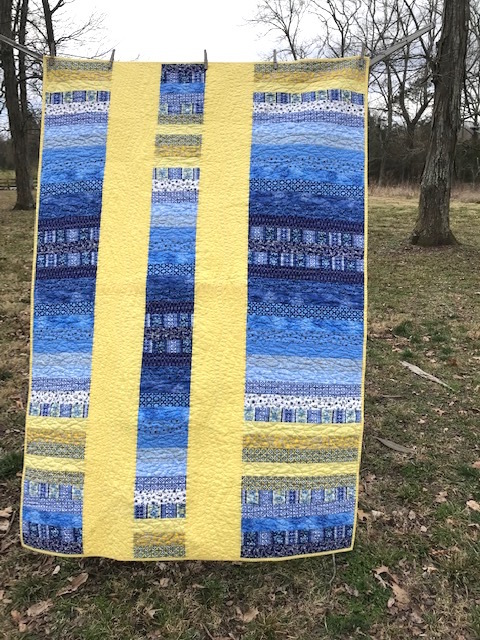 I am always looking for easy and fast quilts for gifts so this one may be in my future! Really love your patterns. I started the last one last night. Thank you so much for sharing these with us. The one I started last night I'm useing 30't prints it going to be a cute baby quilt. Lovely quilt and so simple! I like this! I have a pile of strips, but it will be very scrappy. Our Shubenacadie Sam saw his shadow, so more winter for us. Spring can't get here fast enough. 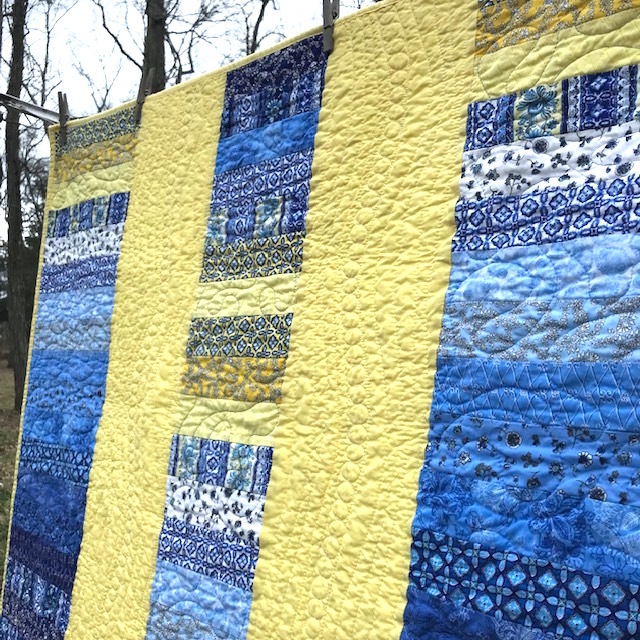 What a beautiful quilt and a great springboard to similarly designed quilts! Excellent tutorial! Thanks for a bit of sunshine, Sarah!! Thank you for the tutorial. I'm already thinking of fabric in my stash that I can use. This is good for days when you just want to do some straight sewing. Great tutorial! Love the quilt, Sarah. This will be great for a comfort quilt for our guild! And I do love the blue and yellow combo!